The folks at OpenSignal released new data today that updates us on the US wireless carrier LTE speed race. In the last major report, their data showed pretty steep declines in speeds from Verizon and AT&T as each had re-introduced unlimited data plans again, while T-Mobile’s speeds only increased, giving them the top wireless speed crown and a sweep of OpenSignal’s “State of the Mobile Networks” metrics. Today, the picture is much brighter for AT&T and Verizon, though they still stand behind T-Mobile in overall speeds. OpenSignal plotted data over an 11-month period from January 2017 to November 2017. As you’ll see in the LTE download speed chart below, at the beginning of last year, Verizon and T-Mobile were neck-and-neck in terms of download speeds, but the minute Verizon introduced unlimited again, the decline began. The numbers here show Verizon bottoming out in August with a 2Mbps drop in speeds from a high in February. AT&T’s decline from unlimited was similar. 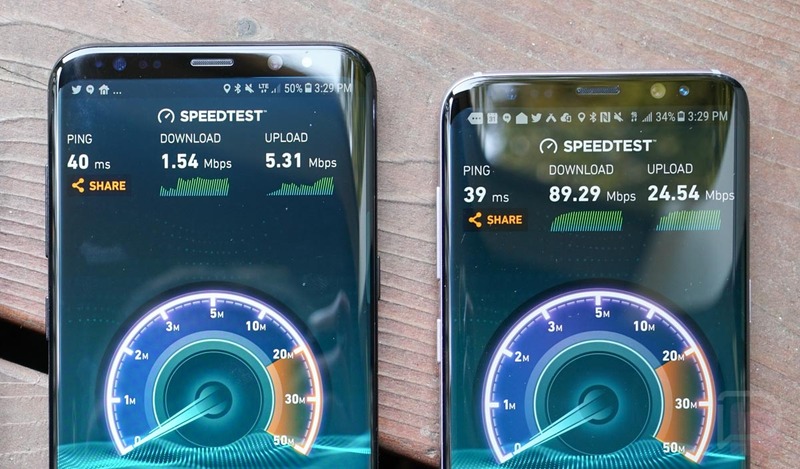 Those declines from Verizon and AT&T gave T-Mobile bragging rights over US wireless carrier LTE speeds, which they still remain the king of, according to this report. However, After August, every US carrier’s LTE download speeds increased, which is exactly what we should all want to see. 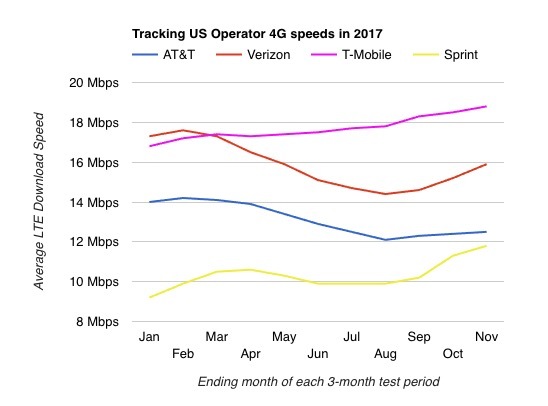 Verizon and AT&T still have work to do in order to regain previous speed highs from early 2017. As an added bonus, Sprint has actually almost caught AT&T at the bottom, thanks to big jumps in speeds in recent months. I will say that after watching all US carriers brag about upgrades to their network over the past year, these numbers are pretty disappointing. Now, I know that another OpenSignal report showed the US lagging well behind other countries in terms of LTE speeds, but don’t all of these average speeds seem low? What about LTE-Advanced, guys? Wasn’t that supposed to be a big booster, Verizon? Eh, T-Mobile? All of supposed 5G-related advancements, with LAA and Gigabit LTE, etc. sure doesn’t look like they are having a massive impact. Anyways, that’s the current US wireless LTE speed situation. Not much has changed as far as the order of speed kings goes, but all are still rising.